"I have been in trouble for drinking, selling weed and beating up people since I was fourteen, and by the age of sixteen I was already in jail." That was Wendell Mills Jr.'s life up until a year ago. In July of last year, two months after his release from a six month term in juvenile detention, his life unexpectedly took a new direction. 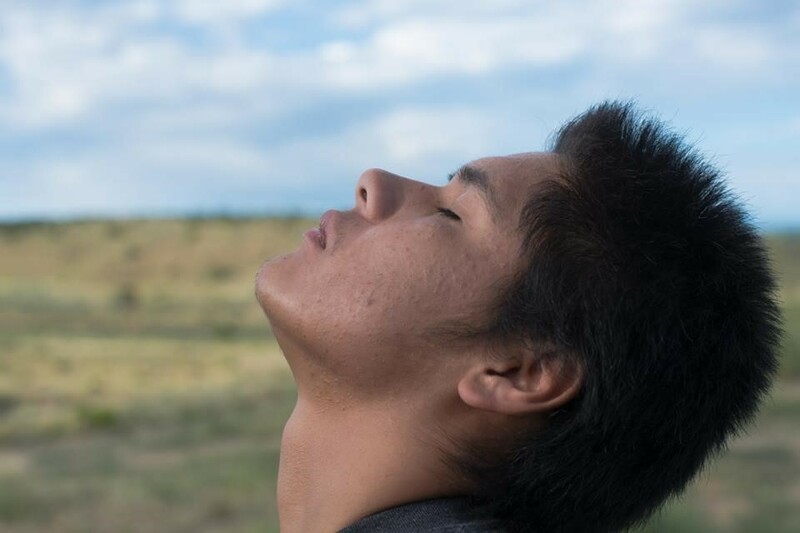 Wendell, a member of the Ute Mountain Ute Tribe (UMUT) in Towaoc, Colorado, who is now 18, vividly remembers that moment. "I was hanging out at the gym, when Alex Munoz, founder and creative director of Films by Youth Inside (FYI), talked to me about taking part in a film class he was offering. I had second thoughts -- I had no goals or plans for my life -- but then I thought, 'I should just do it.'" During the FYI film workshop, UMUT youths wrote, performed, directed and produced the film Escape, which portrays how two teenagers, Adam and Rachel, plan to escape their troubled lives through a joint suicide. Although fictional, the film realities depicted in the film of poverty, drugs and alcohol, homophobia, bullying, and not knowing where to find help, all contribute to the hopelessness of these two young people. Wendell played the challenging role of Adam. Escape premiered in October 2015 and won Best Student Film‬‬‬‬ at the 2015 LA SKINS FEST (the biggest Native American film festival in the United States,) and also won the prestigious Jury Award at the 2016 Garifuna International Indigenous Film Festival. It is the first in a series of five films to be produced in collaboration by UMUT and FYI, in order to teach tribal youth how to tell their stories by making their own films. This partnership resulted from the Ute Mountain Ute Native National Partnership Retreat in April 2015 when Alex Munoz was introduced to Chairman Manuel Heart, Vice Chairwoman Juanita Plentyholes and Treasurer DeAnne House, who invited Alex and FYI to the reservation to work with the youth. The FYI workshop and acting in the film have been transformational for Wendell. His life has changed from "drifting without direction" to getting a job and working towards a GED, as well as aspiring to earn a college degree, to own a car and a house, and to eventually have a family. After his experience at the Garifuna International Indigenous Film Festival in L.A., Wendell even started dreaming of maybe someday living in California. Wendell's transformation has not been without challenges, however. Playing the role of Adam, a gay teenager, made him vulnerable to being harassed by friends and even adults. He said, "I am not gay, but I didn't mind playing that part. But even if I was gay, I shouldn't be harassed for it." Fortunately, Wendell was able to find the strength to break off with those friends who were not respecting him for his decision to play a gay character. This was a critical moment in which Wendell could have easily given up, when he was at risk of being pulled back into his old life. By understanding what motivated Wendell to stay strong, may provide important insights on how best to motivate young people who are struggling to change their lives. The experience of looking out a small jail window for six months had made Wendell acutely aware of how much he wanted to be free. Wendell was experiencing the very profound "growth" need for autonomy that is essential to all people -- the universal desire to be free. Another crucial event that motivated Wendell to change was hearing about the killing of a close friend who had been dealing drugs. While these breakdowns initially inspired him to change, Wendell said "what really helped me change was that Alex and Beverly (Beverly Santicola, executive co-producer of Escape) showed that they believed in me. I never had people like that in my life before." Another important factor that kept Wendell engaged was the sheer joy he felt during and after the film production, including the camaraderie on the film team, and the respect he received from people at the festivals and other events showcasing the film. For example, after a Q&A session in Denver, one young woman walked up to Wendell and said, "I respect you for taking the part of the young gay man. Most young men would not be brave enough to take that part." Being respected and supported like that has been important for Wendell. Wendell also realized that this film addresses a subject that he cares about deeply. As he explains: "There are many different people out there, gay, transgender and others. I learned that it is important to treat people as they want to be treated." Clearly, Wendell has found a greater purpose that intrinsically motivates him. Wendell's journey in changing his life is just at the beginning. Staying intrinsically motivated will be critical for overcoming any challenges that he may encounter. While any young person may be different in what motivates him or her, depending on the person's unmet needs at a given moment in life, growth needs such as having the need for autonomy, self-actualization or making a difference in the world (purpose), create a deeper and more sustained commitment, as can be seen in Wendell's case. Beyond that, a support system with strong role models help to strengthen a young person's confidence and belief to pursue his or her aspirations. I strongly believe that by focusing on young people's growth needs, we can motivate many of our struggling young people to lead healthier, happier, and more fulfilling lives. If you are interested in learning more about the essential role of growth needs as motivators for changing human behavior, please see my recent Huffington Post article "Leaders Must Understand and Empathize With People's Needs to Defeat Radical Fear- and Anger-Mongering."